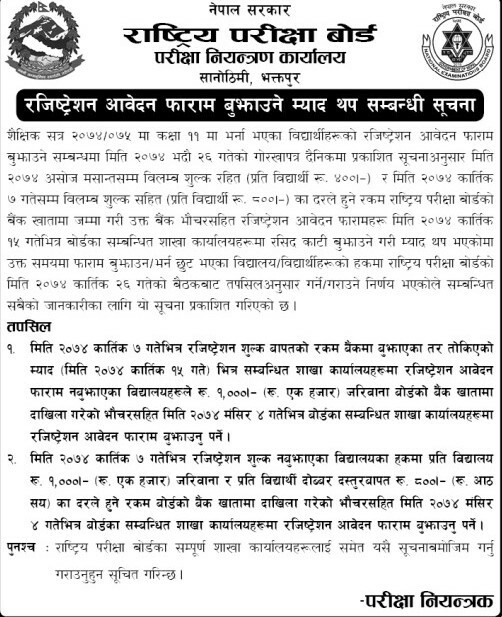 Government of Nepal, National Examination Board, Examination Controller office, Sanothimi, Bhaktapur today publishes a notice regarding submission of registration form for the students who got enrolled in 2074/75. Updated Notice: Examination Board today (Kartik 27) publish a notice regarding deadline extension for the Schools/Students who have failed to submit the registration in the earlier given deadline. 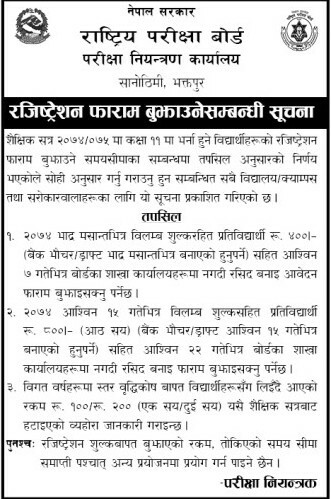 Last date to submit the form (Without late fee): 2074 Bhadra last, Rs. 400 per student. With late fee : Up to Ashwin 15, 2074, Rs. 800 per student.